Earned A Daily Wage Of Rs. 5 Then; Is A CEO In The US Now! Sebin S Kottaram of Malayala Manorama was chosen for top honour os stree Shakti Award, Presented by Press Council of India. Read more.. 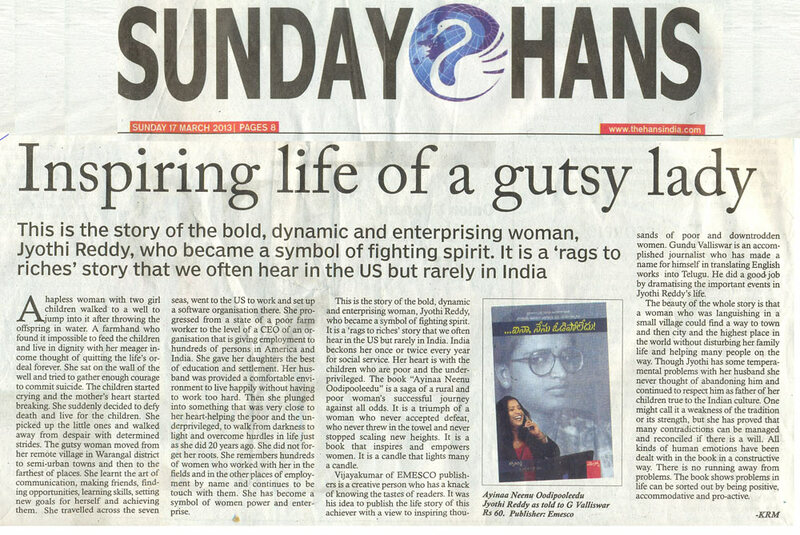 Published in The Hindu On August 30th, 2013 Read more.. 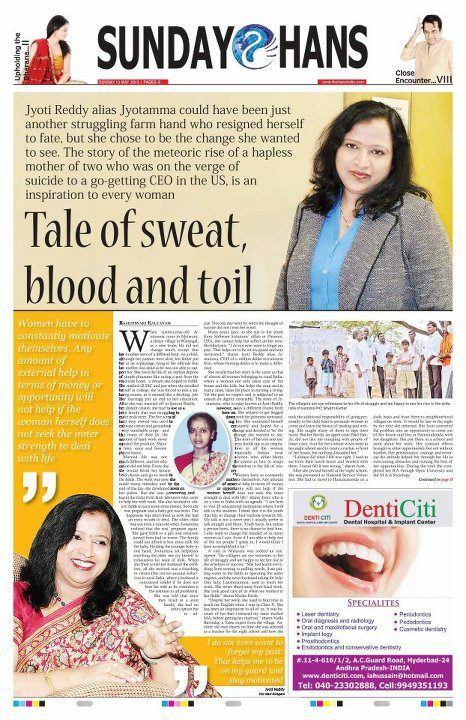 Published in The Hindu On March 11, 2013 Read more..
‘Aina, Nenu Odipoledu’ (Yet, I have not lost) is the story of a woman who was married at the age of 16, became a mother of two by the time she was 18, and her rise in society from Mailarampalli in Warangal district to Phoenix in the USA. 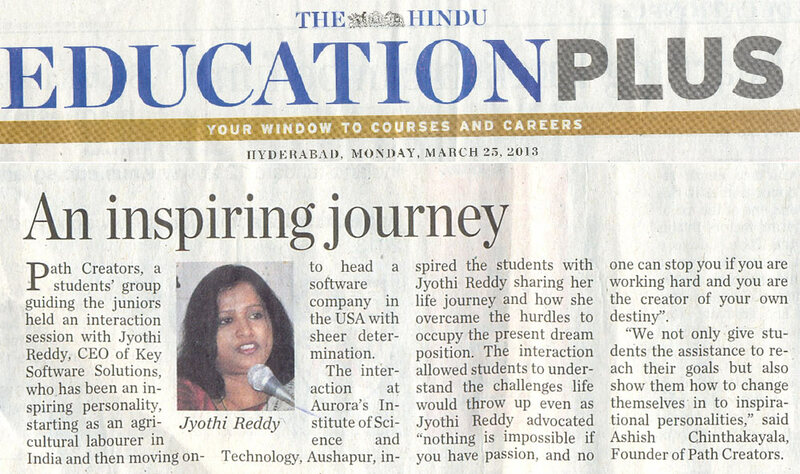 Published in The Hindu On March 02, 2013 Read more..
TD. 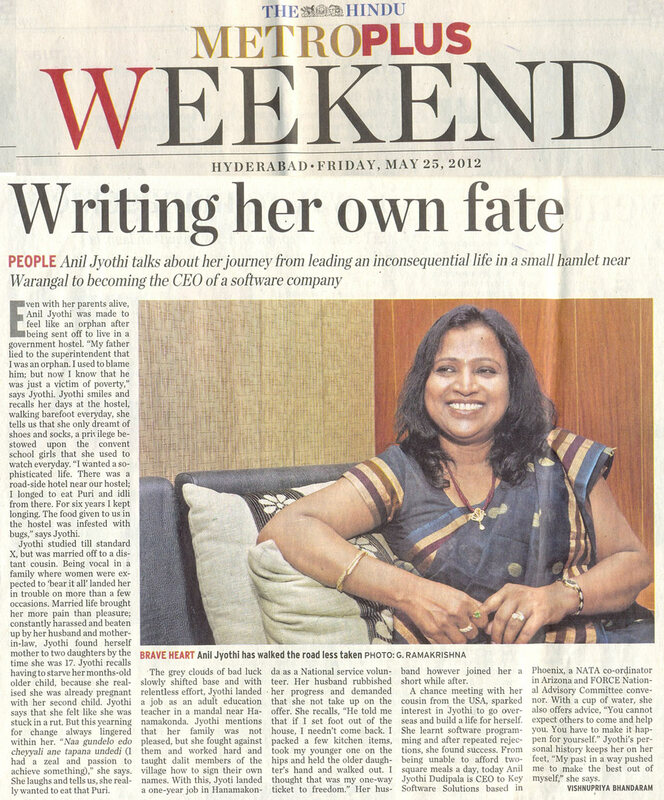 Anila Jyoti Reddy, Chief Executive Officer of Key Soft Solutions Inc, US, has asked the women to live with determination and courage which will change their lives immensely. She exhorted women to work hard to excel in their lives. Published in The Hunsinda On March 08, 2013 Read more.. Published in The Hunsinda On March 02, 2013 Read more.. 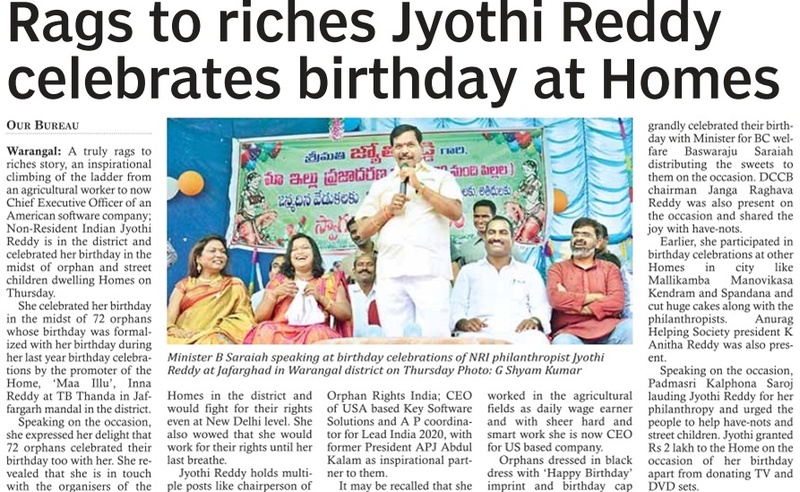 There is no gender equality, says Key Software Solutions CEO Jyothi Reddy Rajahmundry: “There is no gender equality in society and women should get their rights by fighting,” Chief Executive Officer (CEO) of US-based Key Software Solutions Inc. D Anila Jyothi Reddy said here on Friday. Addressing a large gathering of students on ‘Women empowerment’ at a meeting organised by the Lions Club of Rajahmundry-Srujana, commemorating the International Women’s Day, she said education played a crucial role in securing financial freedom for women. 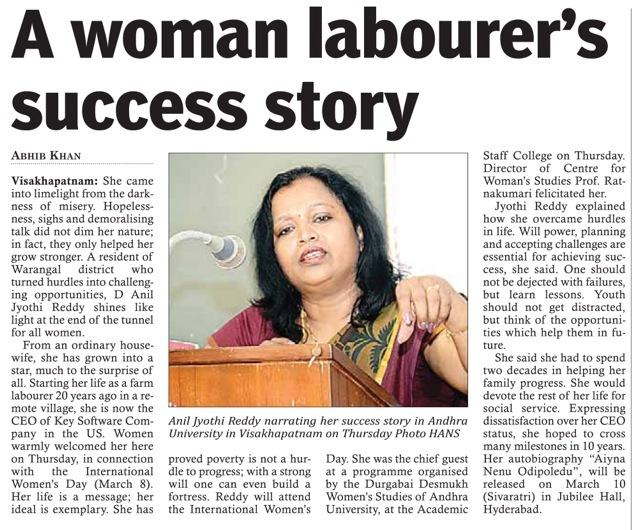 Published in INDIA TODAY On September 06, 2012 Read more..
Interview of Mrs. Jyothi Reddy by Namaste Telangana, A News Daily. 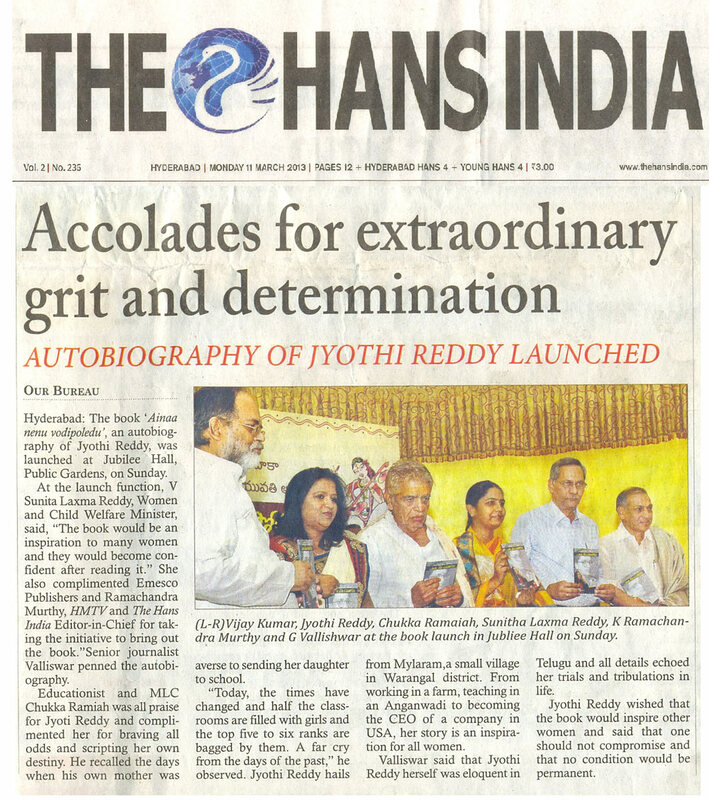 In this article, they compared our Jyothi with the bird Phoenix, which is a symbol for determination. Jyothi has explained her story in the form of lessons she learned from her life. Published in Successstories On April 15th, 2012 Read more.. Published in citehr Website Read more..